​"We'll only improve our water quality in York County when we work as a team. Anything less will short-change future generations of clean water." Residents across Pennsylvania’s part of the Chesapeake Bay watershed—all or part of 43 counties—are working hard to make the streams and rivers in their counties healthier by reducing nitrogen and sediment levels. A key component of their effort: Coming together to hammer out a plan called a “WIP3,” or Phase 3 Watershed Implementation Plan. In their WIP3 plans, counties identify what pollution-reducing projects are needed for specific locations. Projects may be planting trees on streambanks, planting rain gardens in parks, replacing asphalt with porous material, putting in a wetland, reducing fertilizer use on farms and lawns, improving manure management on farms, or others. Then they submit the plan to DEP. We think “planning” is an inadequate word to describe their endeavor, which takes a combination of teamwork, vision, and passion for community as well as case-making, numbers-crunching, and logistics-nailing. So we want to share an inside look at some of the work these awesome Pennsylvanians are doing in developing their WIP3s, as they strive for healthy local waters and communities. Taking the lead in county WIP3 plan development: York County Planning Commission, York County Conservation District, and York County Coalition 4 Clean Waters (YCC4CW). Healthier streams and rivers mean: Clean drinking water in the county, recreational opportunities, the protection of animal and plant life in streams, plus the overall improved quality of life for people that a healthy environment brings. One thing we're especially proud of: Our teamwork. 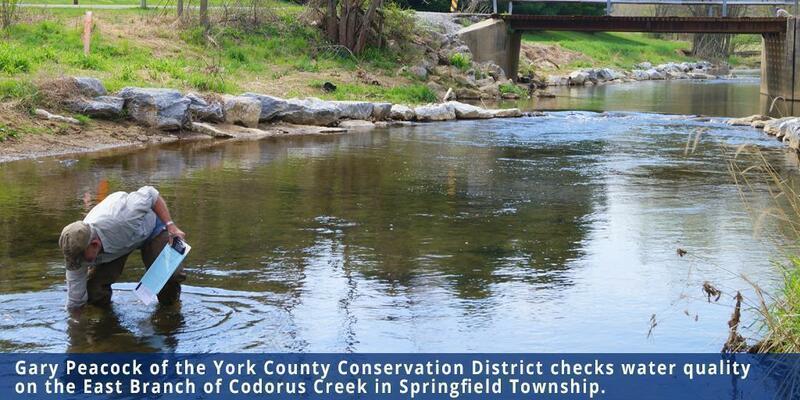 The county and YCC4CW developed a Phase 2 WIP in 2013 with strategies and actions to clean up impaired waters, including voluntary opportunities that anyone could take. This laid the groundwork for our current WIP3 work. Also, we've pulled together municipalities, farmers, the Watershed Alliance of York, watershed stewards and associations, sanitary treatment plant operators, the Lower Susquehanna Riverkeeper, and other partners through the YCC4CW. Of particular note is the Penn State Extension York County Master Watershed Steward program. They've trained 55 county residents to be water stewards in the last three years and will be helpful in communicating the benefits of the WIP and getting projects implemented. We'll only improve our water quality in York County when we work as a team. Anything less will short-change future generations of clean water. Main areas we're focusing our planning on: To reduce stormwater runoff pollution, many types of actions are needed, such as restoring streams; planting trees; managing fertilizer; planting cover crops; writing agricultural erosion/sediment control, conservation, and manure management plans; and providing technical assistance on projects. We're proposing changes in county and state programs to streamline tracking and reporting progress, so that the multitude of needed projects can be carried out more efficiently. Our big pluses: Having the YCC4CW on board is a big plus. Also, we have a Regional Pollutant Reduction Plan that spans 46 municipalities in the county and is managed and funded through the York County Stormwater Consortium. Having the help of dedicated staff from the county, conservation district, DEP, and technical support agencies, such as the Susquehanna River Basin Commission and Penn State Cooperative Extension, is another. Our top challenges: How can we educate and engage more residents? How can we enable changes in programs that we believe are essential to accomplishing the plan? Where to find landowners to host projects? And, of course, where can we get funding to design and carry out projects? We're thinking outside the box on: We're taking a partnership approach, as opposed to each municipality going it alone. Similarly, we're bridging sectors: urban stormwater, agriculture, sanitary treatment plants, etc. We're also promoting creation of a stormwater authority, revisions to the state municipal stormwater permitting process, enhanced water quality monitoring, and watershed permits for multiple projects that achieve improved water quality. The key to our success will be: We're working hard with federal, state, and local governments to try to get our proposed program and policy changes in place. In addition, success hinges on finding funding, enlisting landowners, and educating and engaging more residents. How people can help: In many ways! Call your borough, township, or city secretary, manager, or zoning officer, and let them know they need to be part of the solution. They need to enforce their stormwater management and land use ordinances, maintain their infrastructure, regularly clean storm drains, incorporate green infrastructure provisions into land use ordinances, and educate residents on how to be better stewards. Volunteer your time to committees, attend meetings, and assist with projects such as community cleanups or planting buffers. If you're a farmer, make sure you have required erosion, nutrient, and manure management plans and are putting them in place. Consider joining the Penn State Extension York County Master Watershed Steward program or other watershed/environmental groups in the county that are doing hands-on projects to improve stream health. Take action on your own property. Plant trees and raingardens, reduce or eliminate your use of lawn fertilizer, pick up pet waste, and wash your car on the lawn instead of your driveway. These are just a few things you can do at home that will have a real impact in your watershed.